I often know what an ambiguous sign is trying to communicate, but I like to imagine alternative and more hilarious meanings. At the gym, there are plenty of signs for intentional misreading. By emphasizing the word CAN, I think they mean to highlight the ability of the trainers; to contrast it with CANNOT. 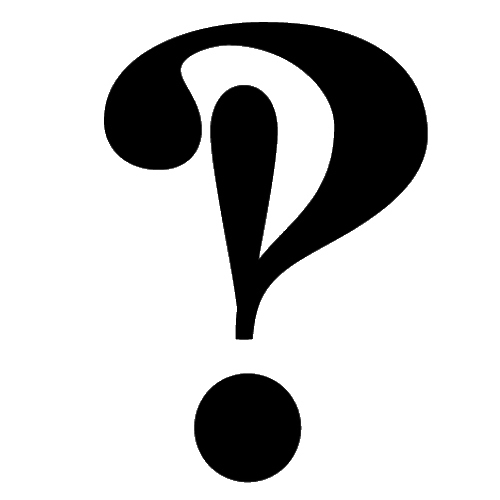 However, I look at the word CAN and emphasize the uncertainty of it; I contrast it with WILL. The sign might as well read "A personal trainer CAN (but won't):" or "A personal trainer MIGHT CONSIDER:". At least it doesn't say "CAN". Which is much more ominous and makes me want to avoid the gym for a while. "Any lock left on after closing will be cut off nightly." In addition to reminding us that anyone with glorified scissors can steal our stuff at any time, what the sign means is that every night, all the locks still on lockers will be cut off and disposed of. But what I imagine, due to the strange use of the singular "lock", is that the same lock will be cut off one night, fixed, put back on, then cut off again the next night. There could be locks from the 1980s that have been snipped and fixed thousands of times due to this nightly ritual sacrifice. They probably stand in a circle wearing black Goodlife-branded robes, chanting motivational clichés, while Patch performs the snippity snip. 1 I'm writing these from memory so it might not be the exact wording. It's something like that, though. I've actually watched them cut a lock off -- in this case, the key broke off in it, and the gym member had gone to staff to ask for help. Considering Goodlife employees are required to work out 3 times a week -- so this guy should be in good shape -- it took several minutes and a lot of tries to cut through the lock. While I think the idea of repeatedly cutting and reattaching the lock is hilarious, I just it might make you feel better to know that getting through a lock, even with bolt cutters, isn't a quick snip-and-go job. I'm disappointed that there was not a "stereo typical gym member" in this post. Some of the best entertainment at the gym is watching these people, and I'd write one of these posts on my own blog, if I was at all capable of writing it in a "politically correct" manner! Oh, I am totally doing that now... whenever I'm in a public bathroom with that Baby Changing Station, I'm gonna white-out the 'C' in changing. What a devilish imp I am. Now, must scour eBay for a white-out carrying case. The story goes that Zeus was so enraged when Patch stole The Good Life from the gods and gave it to mere mortals that he eternally damned the Titan to nightly cutting-off of a single lock which was forged in the very depths of Hades by the King of Gods himself. But that's another story, for another time. Scott: That's comforting. At least nobody can discretely snip a lock without drawing attention. Donald: Hehe, I'm not responsible if you get arrested or slapped by an angry parent. Brian: It's amazing how people aren't even aware of the dramatic history of the Good Life. ALL HAIL PATCH. We were thinking of making a lenzr contest be 'best road signs' but we didnt cause it was ruled to hard. Hey I want to talk to you about the science you and teach. I have an idea for a chemistry cooking show. 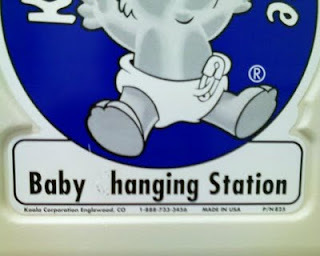 If I saw a baby hanging station sign on a door, I wouldn't dare go inside. There is this naked woman I see at my gym, yes I realize perhaps she is not always naked, she has to get dressed sometime (how else does she get food?). I would know nothing about this of course, because every single time a see her she is naked. And I see her at least 3 times a week, all at different times of day. This last time at 10:30 at night. She never covers herself with a towel and she showers with the shower curtain open!